Learners can use the molecule editor to learn how to create molecules. The molecule editor allows learners to draw molecules that follow the rules for covalent bond formation and formal charge, even if the molecules are chemically impossible, are unstable, or do not exist in living systems. 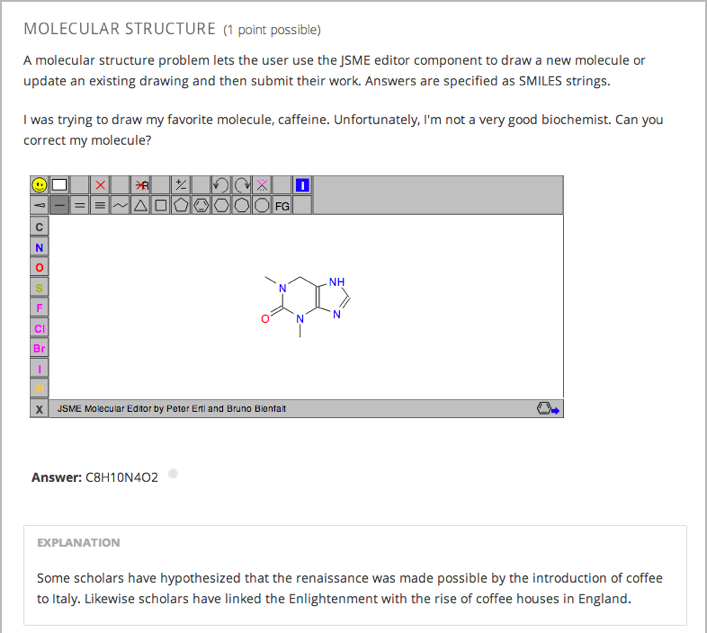 The molecule editor warns learners if they try to submit a structure that is chemically impossible. To create a molecule editor, you need the following files. To download all of these files in a .zip archive, go to http://files.edx.org/MoleculeEditorFiles.zip. The molecule that appears when the tool starts is a dopamine molecule. To use a different molecule, download the .mol file for that molecule from the list of molecules on the BioTopics website. Then, upload the .mol file to the Files & Uploads page for your course in Studio, and change “dopamine.mol” in the example code to the name of your .mol file. To create the molecule editor that appears in the image above, you need an HTML component followed by a problem component. Upload all of the files listed above to the Files & Uploads page in your course. In the unit where you want to create the problem, click HTML under Add New Component, and then click HTML. In the component that appears, click Edit. In the component editor, paste the HTML component code from below. Make any changes that you want, and then click Save. Under the HTML component, click Problem under Add New Component, and then click Blank Advanced Problem. In the component editor, paste the problem component code from below. To create the molecule editor, you need an HTML component and a problem component.